"A crunchy, cool, refreshing salad with a hint of lemon that goes great with grilled chicken on warm summer nights!" Made exactly as written and it was delicious! I brought it to a barbecue and everyone asked for the recipe. Have also made it with quinoa, which is also excellent. Thanks, Jillian! 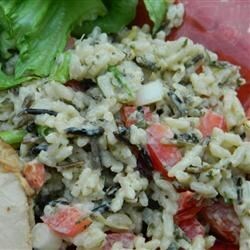 I used 100% wild rice which makes it taste nutty and crunchy (but doesn't look at all like the picture!). Very good! delicious! Made it with traditional wild rice.